StarFinder Aire is also one of the few water resistant (IP 67) tracking devices on the market. 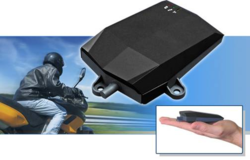 Laipac Technology today announced the release of its slimmest vehicle tracking device. The StarFinder Aire – which gets its name from its aerodynamic profile – is designed for smaller vehicles such as two-wheelers and marine craft. The Aire is also one of the few water resistant (IP 67) tracking devices on the market. The device features a high-sensitivity GPS Receiver that sends location coordinates through mobile data networks. Once equipped, the device is able to transmit its GPS coordinates via SMS, GPRS, or both. In SMS mode, the Aire sends the vehicle’s coordinates to a predefined mobile phone number. The user is then able to input these coordinates online, saving them on cellular data charges. In GPRS mode, the Aire sends location coordinates to Laipac’s-own LocationNow website. The user can then log in to the website and track their vehicle’s location as it moves, in real-time. The Aire also features multiple geofencing capability, which alerts the user when their vehicle is moved outside a predefined area, such as a driveway or parking lot. For covert applications, it can also send alerts when an individual drives the vehicle into a prohibited area. The main advantage of the Aire is its high level of integration with the vehicle. It features 2 inputs, 2 outputs, and an optional analog input, allowing a whole array of capabilities in the event of a theft. For instance, the user can remotely disable the motorcycle’s starter using LocationNow’s web interface, so the thief cannot start the bike again. The Aire is energy-efficient and draws its power from the vehicle’s battery. The Aire has its own battery to maintain functionality when the vehicle is turned off. The Aire is not just designed for vehicle tracking and recovery. It can also be used for monitoring driver behaviour. For instance, parents can monitor when and where their teen is driving their motorcycle or boat, and how fast they are travelling. The device also features an accelerometer to send alerts when the vehicle is involved in an accident. The Aire can also be used for Sailboat, Yacht, Waterjet or other marine vessel. If the device temporarily loses its GPRS signal, it is able to store thousands of location coordinates in its built-in memory. Then when it regains reception, it sends the stored coordinates to the user. The StarFinder Aire will be available in select markets after the second quarter of 2012.